1. Train No. 17652 Kacheguda-Chengalpattu Express is diverted to Chennai Central skipping the stoppages Chennai Egmore, Mambalam and Tambaram stations on 30th March, 2019. 2. Train No. 17644 Kakinada Port-Chengalpattu Circar Express is diverted to Chennai Central skipping the stoppages Chennai Egmore, Mambalam and Tambaram stations on 30th March, 2019. 3. Train No. 12666 Kanniyakumari-Howrah Superfast Express is diverted to run via Chengalpattu, Kanichipuram, Arakkonam, Renigunta and Gudur stations (skipping Chennai Egmore and Tambaram stations) on 30th March, 2019. 1. Train No. 12164 Chennai Egmore-Dadar Central Superfast Express scheduled to depart Chennai Egmore at 06:45 hrs on 31st March, 2019 is rescheduled to depart at 08:45 hrs on the same day. Due to Line Block and Power Block from 00.45 hrs. to 10.45 hrs. o­n 01.07.2018 to facilitate engineering works for construction of two new bridges between Vandalur – Guduvancheri and for construction of additional spans at a bridge between Ottivakkam – Karunguzhi in Chennai – Villupuram section, changes will be made in the pattern of train services on 01.07.2018, Sunday as detailed below. No.66045 Melmaruvathur – Villupuram MEMU passenger, scheduled to leave Melmaruvathur at 11.30 hrs. 2.Train No.66046 Villupuram – Melmaruvathur MEMU passenger, scheduled to leave Villupuram at 13.55 hrs. 1.Chennai Beach – Chengalpattu EMU local trains, scheduled to leave Chennai Beach at 03.55, 04.40, 05.00, 05.20, 05.55, 06.30, 06.45, 07.38, 09.00 & 09.35 hrs., will be partially cancelled between Tambaram – Chengalpattu. 2.Chennai Beach – Tirumalpur EMU local, scheduled to leave Chennai Beach at 07.05 hrs., will be partially cancelled between Tambaram - Tirumalpur. 3.Chennai Beach – Melmaruvathur EMU local, scheduled to leave Chennai Beach at 08.25 hrs., will be partially cancelled between Tambaram - Melmaruvathur. 1.Chengalpattu – Chennai Beach EMU local trains, scheduled to leave Chengalpattu at 03.55, 04.35, 04.55, 05.50, 06.40, 07.00, 07.50, 08.25 & 09.40 hrs., will be partially cancelled between Chengalpattu – Tambaram. 2.Tirumalpur – Chennai Beach EMU local, scheduled to leave Tirumalpur at 10.25 hrs., will be partially cancelled between Tirumalpur – Tambaram. 3.Melmaruvathur – Chennai Beach EMU local, scheduled to leave Melmaruvathur at 15.30 hrs., will be partially cancelled between Melmaruvathur – Tambaram. 1.Chengalpattu – Chennai Beach EMU local trains, scheduled to leave Chengalpattu at 05.10, 07.25, 08.45, 10.50 & 11.50 hrs. 2.Tirumalpur – Chennai Beach EMU local trains, scheduled to leave Tirumalpur at 05.15, 07.05 & 08.00 hrs. ·Train No.56037 Chennai Egmore – Puducherry passenger train, scheduled to leave Chennai Egmore at 06.35 hrs., will be rescheduledto leave late by 2 hours, at 08.35 hrs. ·Train No.56037 Chennai Egmore – Puducherry passenger train will also be regulated at Tambaram suitably, till cancellation of the Line Block and Power Block. ·Moreover, Train No.56037 Chennai Egmore – Puducherry passenger train will be partially cancelled between Villupuram – Puducherry.The train will run from Chennai Egmore to Villupuram o­nly. ·Train No.56042 Puducherry – Tirupati passenger train will be partially cancelled between Puducherry – Villupuram.The train will run from Villupuram to Tirupati o­nly. 1.Train No.16795 Chennai Egmore – Tiruchchirappalli Cholan Express will be regulated at Vandalur for 1 hour and 25 minutes. 2.Train No.56041 Tirupati – Puducherry passenger train will be regulated suitably at Chengalpattu. ·Train No.16127 Chennai Egmore – Guruvayur Express will reach Villupuram late by 1 hour and 30 minutes. 1.Train No.17644 Kakinada Port – Chengalpattu Circar Express, scheduled to leave Kakinada Port o­n 30.06.2018 and reach Chengalpattu o­n 01.07.2018, will be short terminated at Tambaram. 2.Train No.17652 Kacheguda – Chengalpattu Express, scheduled to leave Kacheguda o­n 30.06.2018 and reach Chengalpattu o­n 01.07.2018, will be short terminated at Tambaram. Due to Line Block and Power Block to facilitate engineering works for provision of 3rd & 4th lines between Chennai Beach – Korukkupet, changes will be made in the pattern of train services 31.03.2018 & 01.04.2018 as explained below. A.The following trains will be diverted. 2.Gummidipundi – Chennai Beach EMU local, scheduled to leave Gummidipundi at 21.40 hrs. will be diverted to reach MMC. B.The following train will be partially cancelled. ·Velachery – Avadi EMU local, scheduled to leave Velachery at 22.30 hrs., will be partially cancelled between Chennai Beach – Avadi.The train will run from Velachery to Chennai Beach o­nly. 1.Chennai Beach – Arakkonam EMU local, scheduled to leave Chennai Beach at 01.20 hrs. will instead leave from MMC. 2.Avadi – Chennai Beach EMU local, scheduled to leave Avadi at 08.45 hrs., will be diverted to reach MMC. 3.PTMS – Chennai Beach EMU local, scheduled to leave PTMS at 08.40 hrs., will be diverted to reach MMC. 4.Sulurpeta – Chennai Beach EMU local, scheduled to leave Sulurpeta at 07.25 hrs., will be diverted to reach MMC. B.The following trains will be fully cancelled. 1.Chennai Beach – Ponneri EMU local, scheduled to leave Chennai Beach at 05.30 hrs. 2.Chennai Beach – Thiruvallur EMU locals, scheduled to leave Chennai Beach at 05.30, 06.15 & 09.50 hrs. 3.Chennai Beach – Arakkonam EMU local, scheduled to leave Chennai Beach at 04.20 hrs. 4.Chennai Beach – Avadi passenger specials, scheduled to leave Chennai Beach at 08.30 & 10.30 hrs. 5.Ponneri – Chennai Beach EMU local, scheduled to leave Ponneri at 07.00 hrs. 6.Avadi – Chennai Beach EMU locals, scheduled to leave Avadi at 04.10, 04.25, 06.05, 07.10 & 07.40 hrs. 7.Arakkonam – Chennai Beach EMU local, scheduled to leave Arakkonam at 04.00 hrs. C.The following train will be partially cancelled. ·Chennai Beach – PTMS EMU local, scheduled to leave Chennai Beach at 09.10 hrs., will be partially cancelled between Chennai Beach – Avadi.The train will run from Avadi to PTMS o­nly. D.The following train will be rescheduled. ·Chennai Beach – Gummidipundi EMU local, scheduled to leave Chennai Beach at 09.40 hrs., will leave Chennai Beach late by 20 minutes, at 10.00 hrs. A.The following trains will be rescheduled o­n 31.03.2018. 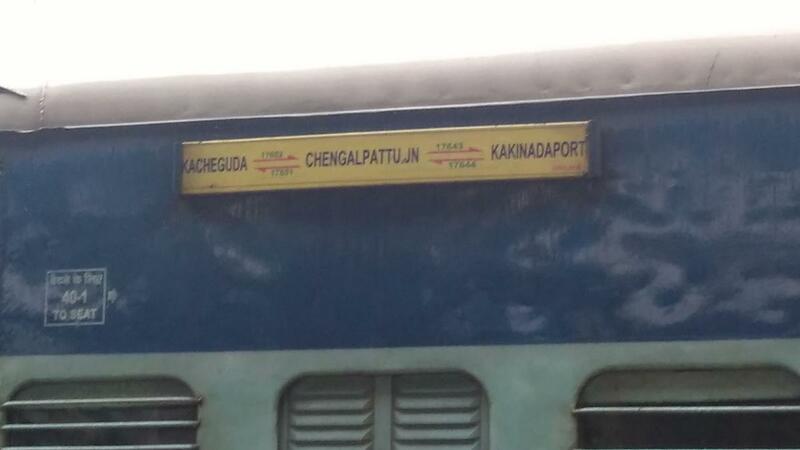 1.Train No.17644 Kakinada Port – Chengalpattu Circar express, scheduled to leave Kakinada Port at 14.30 hrs. o­n 31.03.2018, will be rescheduled to leave late by 2 hours. 2.Train No.17652 Kacheguda – Chengalpattu express, scheduled to leave Kacheguda at 16.30 hrs. o­n 31.03.2018, will be rescheduled to leave late by 2 hours. B.The following train will be regulated o­n 01.04.2018. ·Train No.12651 Madurai – Hazrat Nizamuddin express, scheduled to pass through Chengalpattu at 07.28 / 07.30 hrs. o­n 01.04.2018, will be regulated suitably at Chengalpattu. C.The following express train will be diverted o­n 01.04.2018. ·Train No.12164 Chennai Egmore – Dadar express, scheduled to leave Chennai Egmore at 06.50 hrs. o­n 01.04.2018, will be diverted to run via Tambaram, Chengalpattu, Thirumalpur, Arakkonam and Tiruttani to reach Renigunta. Due to Line Block and Power Block to facilitate engineering works for provision of 3rd & 4th lines between Chennai Beach – Korukkupet, changes will be made in the pattern of train services on 29, 30 & 31 March, 2018 as explained below. A.The following train service will be diverted o­n 29.03.2018 & 30.03.2018. – Chennai Beach EMU local, scheduled to leave Gummidipundi at 21.40 hrs. will be diverted to reach MMC. B.The following train service will be partially cancelled o­n 29.03.2018 & 30.03.2018. A.The following train service will be diverted o­n 30.03.2018 & 31.03.2018. ·Chennai Beach – Arakkonam EMU local, scheduled to leave Chennai Beach at 01.20 hrs. will instead leave from MMC. B.The following train services will be fully cancelled o­n 30.03.2018 & 31.03.2018. 1.Chennai Beach – Arakkonam EMU local, scheduled to leave Chennai Beach at 04.20 hrs. 2.Chennai Beach – Thiruvallur EMU local, scheduled to leave Chennai Beach at 05.30 hrs. 3.Chennai Beach – Avadi passenger special scheduled to leave Chennai Beach at 10.30 hrs. C.The following train services will be partially cancelled o­n 30.03.2018 & 31.03.2018. 1.Velachery – Ponneri EMU local, scheduled to leave Velachery at 04.45 hrs., will be partially cancelled between Chennai Beach – Ponneri.The train will run from Velachery to Chennai Beach o­nly. 2.Ponneri – Velachery EMU local, scheduled to leave Ponneri at 07.00 hrs., will be partially cancelled between Ponneri – Chennai Beach.The train will run from Chennai Beach to Velachery o­nly. 3.Velachery – Thiruvallur EMU local, scheduled to leave Velachery at 05.30 hrs., will be partially cancelled between Chennai Beach – Thiruvallur.The train will run from Velachery to Chennai Beach o­nly. 4.Avadi – Velachery EMU locals, scheduled to leave Avadi at 04.10, 04.25 & 06.05 hrs., will be partially cancelled between Avadi – Chennai Beach.These trains will run from Chennai Beach to Velachery o­nly. 5.Arakkonam – Velachery EMU local, scheduled to leave Arakkonam at 04.00 hrs., will be partially cancelled between Arakkonam – Chennai Beach.The train will run from Chennai Beach to Velachery o­nly. D.The following train services will be rescheduled o­n 30.03.2018 & 31.03.2018. 2.Avadi – Velachery EMU local, scheduled to leave Avadi at 07.10 hrs., will leave late by 5 minutes. 1.Train No.12164 Chennai Egmore – Dadar express will be regulated suitably at Chennai Beach. 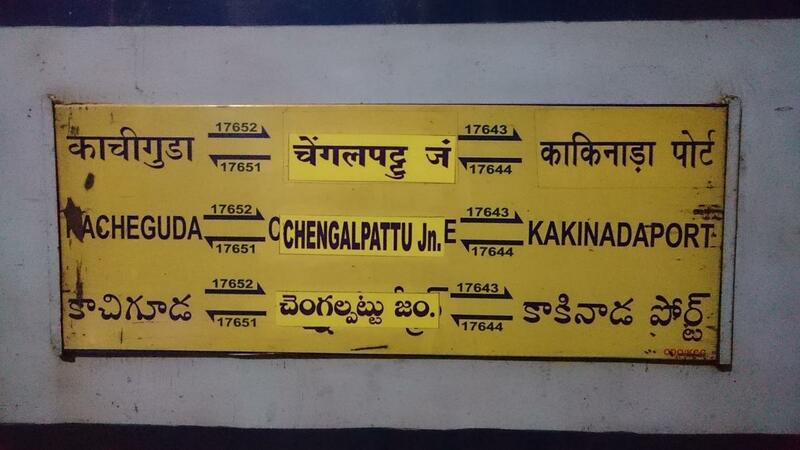 2.Train No.17644 Kakinada Port – Chengalpattu Circar express will be regulated suitably at Korukkupet. 3.Train No.17652 Kacheguda – Chengalpattu express will be regulated suitably at Ambattur. 1.Train No.12164 Chennai Egmore – Dadar express will be regulated for 10 minutes at Chennai Beach. 2.Train No.17644 Kakinada Port – Chengalpattu Circar express will be regulated for 2 hours at Korukkupet. 3.Train No.17652 Kacheguda – Chengalpattu express will be regulated for 1 hour and 30 minutes at Ambattur. 1.Train No.17652 / 17651 Kacheguda – Chengalpattu – Kacheguda express trains will be permanentlyaugmented by one AC 3-tier coach ex Kacheguda from 28.02.2018 and ex Chengalpattu from 03.03.2018. 2.Train No.17643 / 17644 Chengalpattu – Kakinada Port – Chengalpattu express trains will be permanentlyaugmented by one AC 3-tier coach ex Chengalpattu from 01.03.2018 and ex Kakinada Port from 02.03.2018.